MIRO's main batteries are accessed through a panel on the underside. 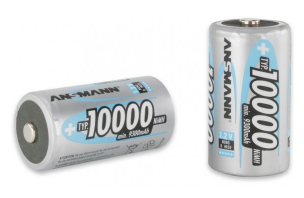 Four D-type NiMH rechargeable batteries weighing 100g per cell or more are required. We heartily recommend using 10Ah cells, which will maximise MIRO's run time between charges, but MIRO will run just fine on smaller cells. MIRO is mechanically designed with a total battery weight of at least 400g. Four D cells with a capacity of 5Ah or more will typically meet this requirement. If lighter batteries are used, MIRO will run but may rock forward under rapid deceleration. Always remove the batteries from your MIRO when it is not in use. If your MIRO's batteries are getting low, you may hear something that sounds a bit like a satellite from the 1970s. This is MIRO's battery-low warning, and you should turn the robot off immediately and remove the batteries for recharging. To change the batteries, first ensure that MIRO is turned off. Now turn MIRO upside-down and support it securely by resting the body shell (and only the body shell) on something soft—see image for one solution. Now locate the battery cover shown in the image. Undo the screw marked by a blue dot to release the battery cover. 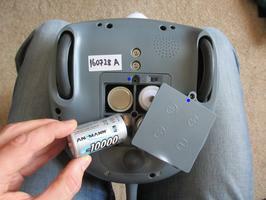 Insert or replace the batteries, making sure the polarity is correct as embossed on the underside of the battery cover. 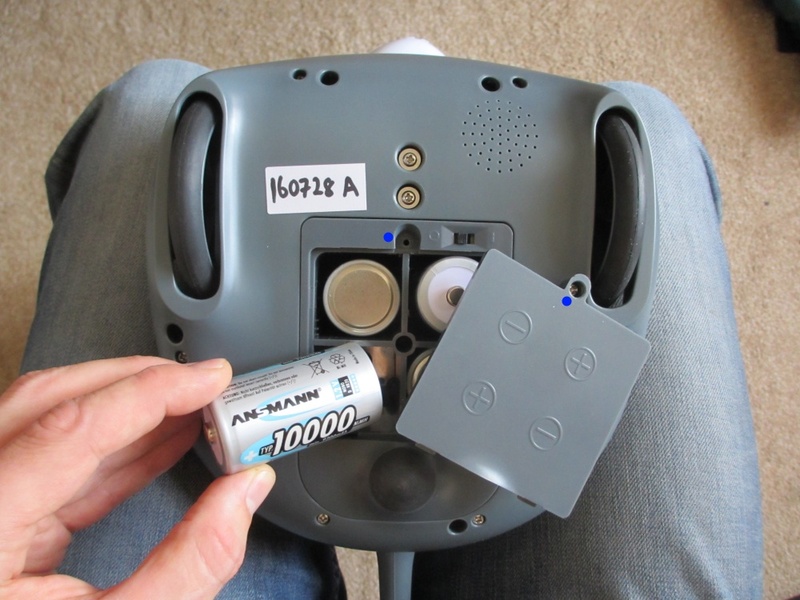 The image shows correctly-inserted batteries. Replace the cover to complete the job.